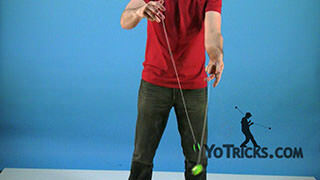 Learn about the concept of Planes as it applies to two handed yoyoing. 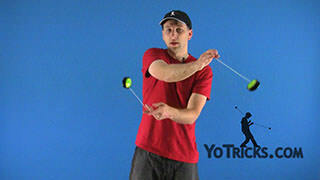 2A Terminology: Planes Yoyo TrickIn this video, we will be borrowing some terms from another related skill toy called Poi in order to help us define and classify the spatial orientations of our 2A tricks. By this, I mean Planes: The three dimensions of 3D Space which we will be defining in 2A as the Wall Plane, the Wheel Plane, and the Ceiling Plane. Planes are the imaginary surfaces drawn by the string as it traverses through the trick. 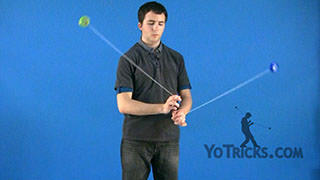 When thinking of the Wall Plane, throw a breakaway, and you will notice that the string traverses around as though you are facing a wall. If you throw from the other side, it will face the wall the same as well, so both of these will be considered Wall Plane. The Wheel Plane is, imagine if you have wheels attached to the sides of your body, and whenever you do a trick where the string is parallel to the wheels below, then you are in Wheel Plane. Not only is this true in Around the Worlds, but it is also true in loops, where an ideal loop is going to be tilted off Wheel Plane, but the string itself it going to be parallel to the wheels below and you will be considered in Wheel Plane. So not only is it true in loops, but hops, flips, and even shoot the moon will also be considered in wheel plane. Since these two planes are vertical planes we are going to be dealing with them in terms of our body orientation, or which way we are facing. Since I am facing forward, this will be the Wheel, and this will be the Wall, but when I face to the side, this will become the Wall, and this will become the Wheel. 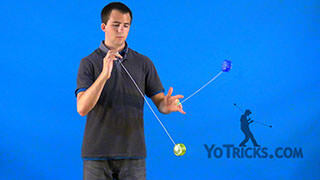 When dealing with the Ceiling Plane, also called the Horizontal Plane, or the Floor Plane, the nature of this plane is going to be different than the vertical planes because it will be really hard to spin it fast enough so that way the string does not hit the sides of the yoyo. 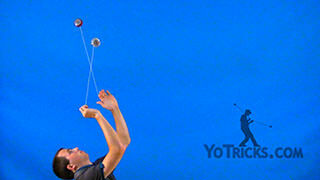 So, when you are dealing with this trick, you are going to want to throw it as though you are throwing a frisbee above your head at first, and when you are doing it the other way, this is as though you are throwing a frisbee to the outside. You just want to practice it one repetition at a time up until you can hit about 3 or 4 repetitions of it and then you should be good to go. Now there are going to be some other concepts to deal with in terms of these planes too. So one in particular is, imagining the Wall Plane being in front of you, but you can also be in wall plane with it behind you. Those are called Reels. 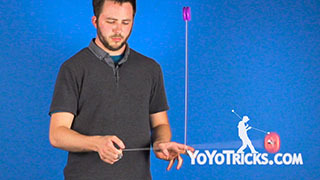 So you can actually have the yoyo go underneath and behind you and then you can have the yoyo go around behind your head and that would be considered a Reel. 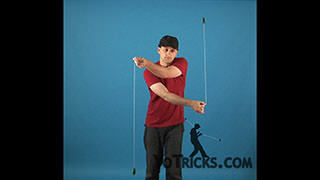 You can also have it go around your shoulder and if you actually bring your hand across the other side, and do Reels on the opposite shoulder, these are called Crossers, or Straightjacket. So you can go around any body part that you like and as long as you are in the Wall Plane in front, and behind and going back and forth between the two spaces, you can consider that the concept called Reels. So the next thing to think about in terms of planes is going to be this gray area in between where it does not seem like you are in quite one plane, and maybe not quite in another. The most basic example of that is going to be an Around the World into Wheel Plane, then turn your body into Wall Plane, and then turn your body back into a Wheel Plane. This is tough to tell because it is hard to determine when the Wheel Plane ends and the Wall Plane begins. So the most basic idea for this is going to be consider it a wheel plane up until 45 degrees. And past 45 degrees you can then consider that a wall plane. When it comes to this though it is hard to determine what is forward because with your body orientation your feet may be pointed in one direction while your hips and shoulders are pointed somewhere else, so it is hard to determine which way is forward. 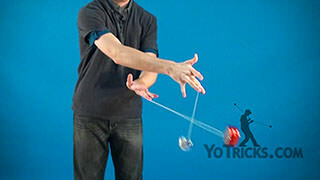 So when it comes to that, since both the wall plane and the wheel plane have a yoyo that is sleeping vertically, you can just kind of hand wave it, give a little bit of leeway between one and another. Especially during wrap tricks, it is going to just be this gray area in between. The next place to think about on this gray area is going to be when you are thinking about 45 degrees from the Ceiling Plane. So that would be loops being done to the side on purpose like this, and with other things like throw to the side, and even doing an Around the World to the side as well. When it comes to this angle, you can just consider it called Off Axis. 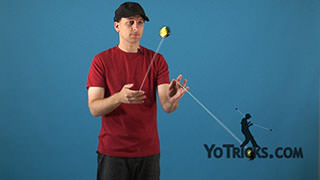 Even though it is not quite Horizontal, and it is 45 degrees down, it is still enough to consider it not completely straight up and down, so we will call this off axis because it is off the axis of the normal spin of the yoyo. 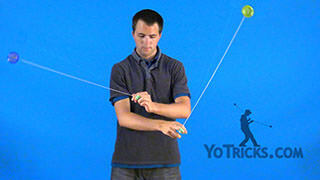 So now that we have defined the planes and some of the spaces in between them, we can now think about Planes in terms of two yoyos instead of just one, and how they interact with each other. The most basic form of this is going to be Parallel Planes, where both yoyos are going to move either in wheel plane, in wall plane, or in ceiling plane. 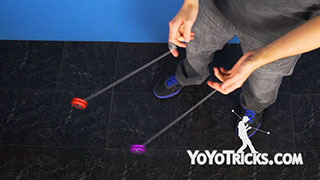 So some examples of that would be both yoyos are in wheel plane when you are doing two Around the Worlds even no matter what timing you are using, things like that and when you are doing your weaves and some of your crossovers, even those are considered parallel planes, even thought it seems like the yoyo is changing planes, it is actually changing from one wheel plane to another wheel plane, so that means that the yoyo is always in wheel plane during the trick, so that means the trick is in parallel planes since both yoyos are in wheel plane. Some more examples of that would be say your loops, which are in wheel plane, and even your crossover loops and all your variations, so this is all considered Parallel Planes. And even say, some of your milk the cow combos, these are parallel planes too. 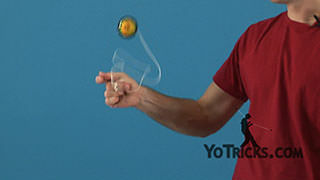 Then in terms of wall plane, these can also be any form of butterfly tricks, so the butterfly wrap, the butterfly itself, and even having the yoyos move in tandem to each other, all of this is considered parallel planes. Also there is some examples above the head, like doing a butterfly above the head, or even doing some loops that go completely horizontal, these are all considered parallel planes as well. 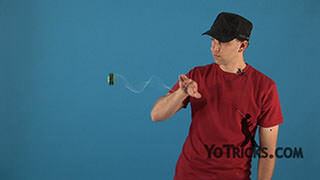 Now the tricks that are left over are called Atomic Planes, that is one yoyo is in a certain plane, and then the other yoyo is in one of the two other planes you have not used yet. So, any time that you do that, it means that these planes are intersecting. 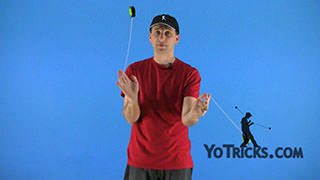 So the most basic example for working on your Atomic Planes is going to be throw a breakaway with your strong hand, and a forward toss with your weak hand, and have them both go into around the worlds. You will notice that the Around the Worlds there were in Split-Time, so if you have not seen our video on Rhythm and Timing, go ahead and check that out. It is important with that when you are doing Around the Worlds in Atomic Planes that cross over each other that they are in split time because if they are in same time then the string will cross each other and who knows where the yoyos will end up once they cross each other. So when it comes to other examples of wheel plane and wall plane, a good example of that would be Sword and Shield. There are other things you can do with looping and Around the World, so you can have looping be your wheel plane, and have an Around the World be in horizontal plane, which is a good one to work on. You can also get a little more creative with your around the worlds and have them weave and cross over each other. You can do things in different rhythms and timings when you are mixing your loops together in different fashions. You can have loops off to the side, and pointing every which way, so it is a goo idea to start exploring the space of the Atomic Style, because it is very visually appealing. So with all that said, when it comes to planes, and how we work on them, we tend to have this bit of a leeway definition in terms of the different planes with each other. We can be a bit forgiving in terms of if you are not completely facing where you are supposed to be. 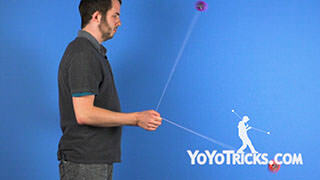 But in terms of the yoyos themselves, they are not going to be as forgiving. 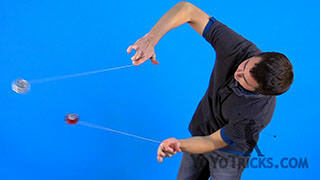 So if you throw a yoyo into a certain plane, you want to make sure it stays in that plane when it is a long spinning trick, or else when you change planes the string is going to hit the side of the yoyo and then the yoyo is going to die out very quickly. 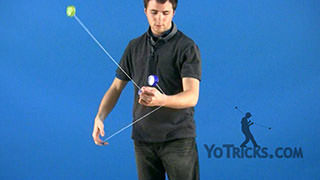 So in Poi it is very important to have good plane control in order to help yourself work through your weaves and your different timings, but it is even more important in 2A because the yoyo is going to be spinning and in order to maintain that spin, you want to make sure that the string does not touch the other side of the yoyo during the entire course of the trick. 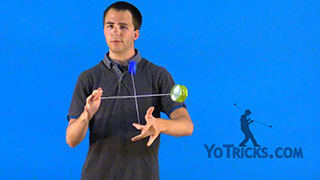 So just keep working on your plane control every once in a while, be sure to check at the end of the trick that the yoyo stays completely up and down. if you are doing your looping tricks, you just want to make sure that angle stays the same every single time, and this will help you get the most spin time you can out of your different tricks, and get the most consistency out of your looping. And that is the definition of Planes and how they will help you in 2A.